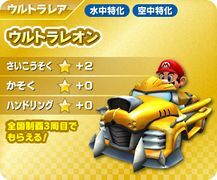 The Ultra Leon is a kart in Mario Kart Arcade GP DX. Its name derives from the Greek word for lion, "Leon". Its appearance is made to resemble the head of a lion, with its exposed engine being the nose, and the windshield being the eyes. Its alternate colors are blue and silver with areas of red. This page was last edited on October 22, 2018, at 14:51.